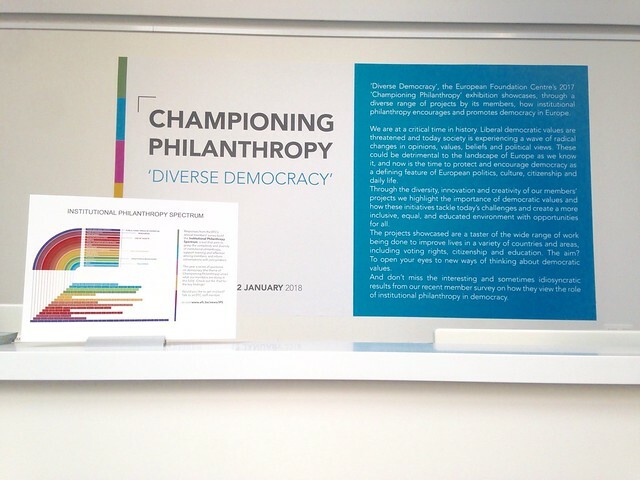 The European Foundation Centre (EFC) is pleased to announce the opening of “Championing Philanthropy – Diverse Democracy”. The exhibition, showcasing a number of projects, undertaken by members, is an innovative and creative selection of projects that help us to discover what democracy means in Europe today. The exhibition, which runs until 12 January, opened during the EFC’s Governing Council meeting on the 21st of January. Diverse Democracy presents a selection of projects from our members to visitors in a variety of forms, and they are invited to engage and explore with all their senses. Visitors do not simply look at the objects: they need to interact and get involved! The content of the exhibition explores the way in which democracy manifests itself on the ground in society, and showcases the many forms it is being promoted, encouraged and spread throughout different European countries. This is especially relevant today as we see democratic values threatened, and now is the time to protect and encourage democracy as a defining feature of European politics, culture, citizenship and daily life. Through this diverse selection of projects, the efforts undertaken show how institutional philanthropy is deeply involved in supporting democracy in Europe. In showcasing the efforts of our members we are highlighting the critical role of democracy and how we can think outside the box to tackle the challenges in creating a more inclusive, equal and educated environment, with opportunities for all.